The thing I would quibble about most here is the bots. Great CTF map! I was very impressed. Very creative architecture which kept a consistent theme thoughout the map. Great job texturing and lighting, with good attention to detail. The lighting set such a great atomsphere and tone to the various parts of the map which made you feel there. 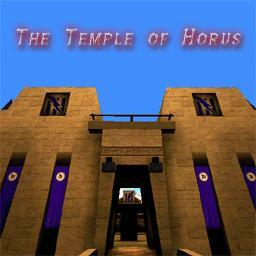 Therefore, good choice for the name of the map, horus, god of the sun. Good use of teleporters and signs associated with them. Gameplay was great. It is definetly a CTF map made to be played with a large volume of players. I loved how so many choices are given to the player in the map by way of escape areas, sniping, and strategy. Loved how the underwater element was integrated into the map in a realistic manner. Great weapon placement and weapon selection. FPS was relatively high and constant, and gameplay was consistant. Outdoor and indoor lighting could be improved in some areas (e.g. unusual shadows cast outdoors and light with no lightsource indoors). Overall, great map! And i love traps. But this map contains not 1.. It is a perfect map for traps. A shame. Here we go again down memory lane. AHHHHH!! ARGHHHH!! What's with all this nostalgia? With that said, an 8 for a good (though kinda big) map. Boy do I wish there were more maps of this quality for groups of 6 to 8.